Find a vacation home to rent in Karlstad Municipality from our list of vacation rental properties. Campaya has over 13 vacation homes available in Karlstad Municipality, which give you the possibility to locate a unique accommodation in Karlstad Municipality which completes your check-list in search for the perfect self catering vacation apartments in Karlstad Municipality or vacation villas in Karlstad Municipality. A dream holiday house with its own bay and a private harbor. From the terrace all on the pier you have a wonderful panoramic view of the largest lake in Sweden: Vänern. Cozy and newly wisely cottage, fireplace and sofa bed in the living room and two bedrooms, nice beds beherberged. Forehand to a bedroom. The location is deposited and on a dirt road. 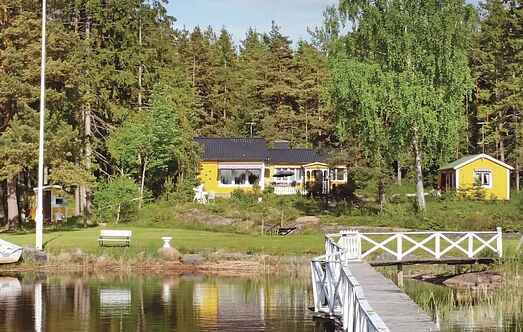 Simple, nice holiday house in Älvsbacka Kyrka, about 200 meters from the family-friendly beach. Very cozy, renovated with care to preserve original elements cottage. Living room with fireplace and sofa bed, two bedrooms with nice beds. A homely and quiet terraced house in Karlstad, close to the family pool and the large shopping center Värmland, the Bergvik. The bedrooms are in a terraced house on the upper floor. This nice holiday home is situated in a very good location. The house offers panoramic views of Samstorpstjärnet, where you can catch fish for supper. The house also has a private boat. Modern and exquisite holiday home which is situated directly by Vnerns beach with good bathing possibilities. This cosy, new house of high standard is situated amidst magnificent nature with rich wildlife. You can relax on the large terrace. The annex has two beds. This nice and cosy holiday home is situated on the house owner's plot in a wonderful area, 5 metres from the western beach of Gapern lake. This holiday home is on the top floor of a manor house. Enjoy a beautiful view of Lake Alstern from here. Seenah and 2.5 km from the center Karlstad, so is the villa that dates back to 1900. It was renovated in a way that kept the original style. You can play records here.